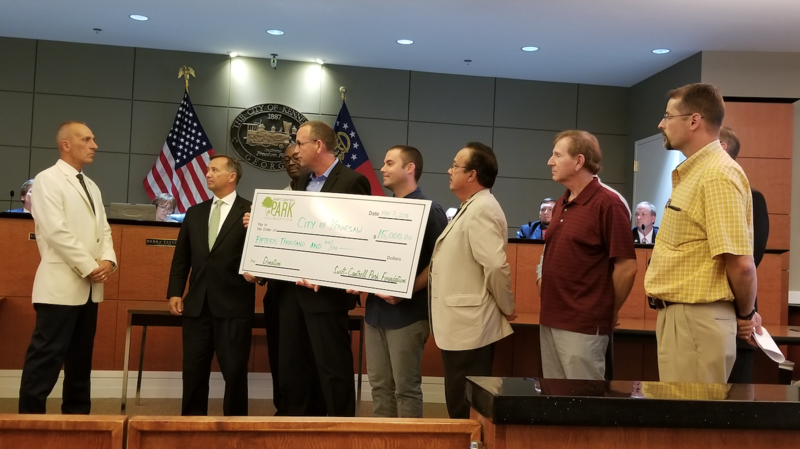 The Swift-Cantrell Park Foundation donated $15,000 to the City of Kennesaw to assist in erecting shade structures at the Kennesaw Skatepark. The donation comes as part of a cooperative deal with the city to bring much needed shade to the skate plaza. The Swift-Cantrell Park Foundation is a non-profit organization dedicated to making capital improvements at Swift-Cantrell Park that enhance the park experience and benefit the community. In the past 3 years, the Foundation has also installed shade structures in the playground and helped fund the Splash Pad. “We are committed to making Swift-Cantrell Park a premier recreation space in Cobb County,” remarks Swift-Cantrell Park Foundation President, Phil Barber. “We have some big ideas for the next park upgrade and will continue to do what we can to support the city and park as much as possible”. The Swift-Cantrell Park Foundation raises money for the park by hosting the Swift-Cantrell Classic benefit 5K as well as donations from local citizens. If you would like to support the park by participating in the race, please click here. Or, to make a donation for future projects, click here.